We use the highest quality paints and sealants available to apply a professional colour matching finish to keep your car looking like new. When dealing with bumper scuffs Mansfield, our repair technicians are highly skilled in bumper technology and they use innovative techniques that assure the highest level of workmanship. Specialists in colour matching for colour coded bumpers. 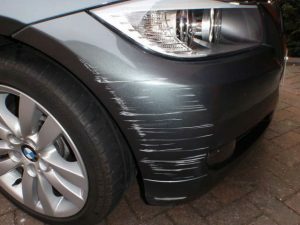 Providing paint chip repair, bumper scuff repair, alloy wheel repair, vandal scratch repair and all minor paint imperfections in Mansfield, Nottinghamshire. Paint Chip Techniques, Mansfield, can repair your cars damage usually on the same day and normally within your insurance policy excess cost, making an insurance claim unnecessary, keeping your no claims bonus intact and keeping your premiums in check . So easily done on today’s roads and car parks. Scrapes need looking at as soon as possible as the exposed area will start to be eroded by the elements, air particles and road debris. Very common occurrence. You come back to your car from a visit to the shops and it has been glanced by another vehicle. No sign of the offending vehicle so you are faced with the repair yourself. Our craftsmen will handle your repair with expertise and professionalism. The same level of service is applied to all vehicles from small or older cars right up to rare and super cars. Book your vehicle in today for a fast turn around and restore your vehicle’s condition.